This manor, well preserved and still partially inhabited, stands in a pleasant green surroundings near a pond. It has kept the charm of the Great Epoch. The Plessis Josso is classified as french "Monument Historique". This beautiful Breton building has kept its fortified ramparts which were protecting the house against the pillaging bands during murky periods (16th century). 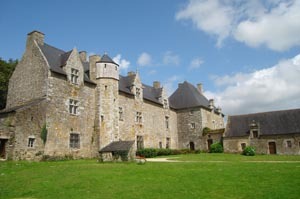 The first buildings of the Plessis Josso were built in 1330 by Sylvestre Josso, squire of the Duke Jean III, during the period of Succession war (14th century). In the 16th century, alliances made it pass to the Rosmadec family (powerful family which was reigning at this time on an estate of nearly 600 ha). This family enlarged the buildings, and reinforced the house security with ramparts and defence towers. The Plessis Josso accommodated several important persons, like the Vannes bishop, seneschals and Breton governors. 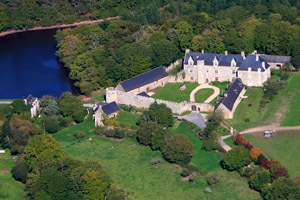 At the end of the 18th century, it became the property of Le Mintier de Léhelec family. This family still lives there today. 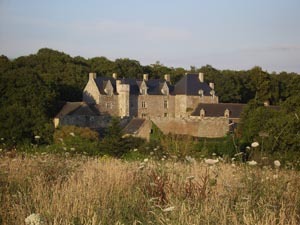 The Plessis Josso, like all Breton manors in the 15th century, had an agricultural vocation: it was managing an domain of 1500 hectares, several villages, and a population of about 500 persons. Several buildings around the manor point out its economical function: barns, water mill on the pond (1783), baker's ovens, commercial port... Its role evolved at the end of the Middle Ages, to become more political, economical, and administrative. People were then using the manor for accommodation, as shown by the main logis facilities, the chapel, the orangery, or the entirely panelled pageantry bedroom.